I am finishing up the next pass of YAVE's light propagation system and one thing I needed to do was reduce that number of expensive computations that go into spreading light from one block into another. In photography terms, increasing a L_b by 1 means increasing the luminance of some object lit by that block, in that direction, by a sixteenth of an f-stop. * I am simplifying this somewhat but not a lot. ** This will increase in the future to allow colored light and other shenanigans. Where L_h' is the new value of the light, L_h is the old value and L_n_i is the light value of each of the neighbors. Where b_sum is a value typically assigned to a particular block and direction, L_b_i is a light value in a neighboring block, and w_i is a floating point weight between 0 and 1. The naive implementation of this was quite slow, and maybe you can see why. Each time I updated the light value of a block and face, I would need to perform six expf() operations and then a logf() operation. So I turned to that time-honored optimization trick, the lookup table. The simplest optimization was to observe that since L_b_i could only take on a value between 0 and 255, I could make a lookup table to quickly compute 2^c_i. This saved me from having to compute exp2f several times within the inner loop. The savings were hardly chump change. -16*log2(w_i) would either round pretty well to a byte or it would be so small as to not significantly affect the lighting. Maybe for a physically-based renderer this would be a problem, but YAVE is designed for stylized games set in a cube world. I replaced these weights with -16*log2(w_i), and made it so they get added to L_b_i before it goes into the lookup table. This replaced a float multiply. It was of little performance benefit, although I figured it would maybe pay off later. It turned out to pay off while I was solving the last problem with the computation, that damned log2f! Even if I used a fast implementation, that would still be a major drag on the speed. I decided it was worth it to try to execute that as infrequently as possible. I had some ideas for things I could do to remedy this. The best idea was get the log2 to the nearest sixteenth by adding the floats as normal, taking the exponent bits of the float as the whole number portion of the log2, and using a range lookup to get the fractional part. But bit manipulation fries my brain, I was lazy, and decided that for the time being, I could take advantage of the fact that if one of the c_i' values was significantly larger than the rest, I use it as an approximation to b_sum. 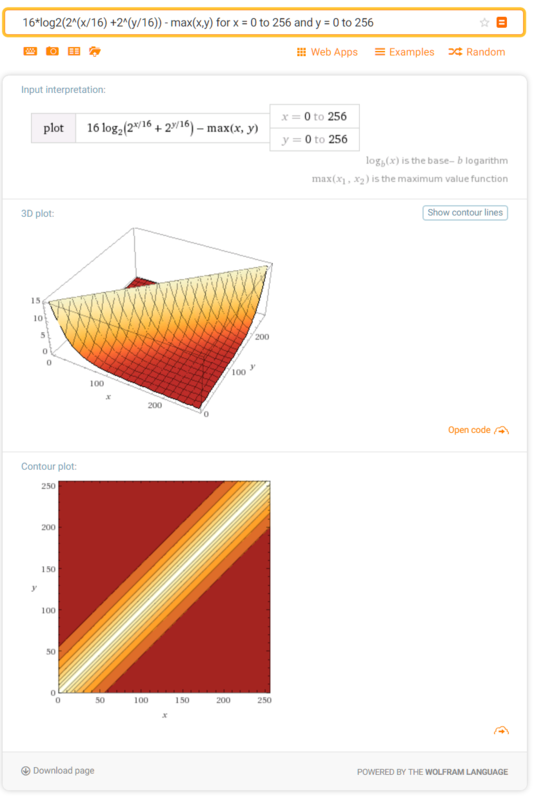 I made a plot using WolframAlpha to get a gauge on how damaging this would be. I was surprised by the result. It looked as if the difference between log2(2^x + 2^y) and max(x,y) was affected solely by the difference between x and y! 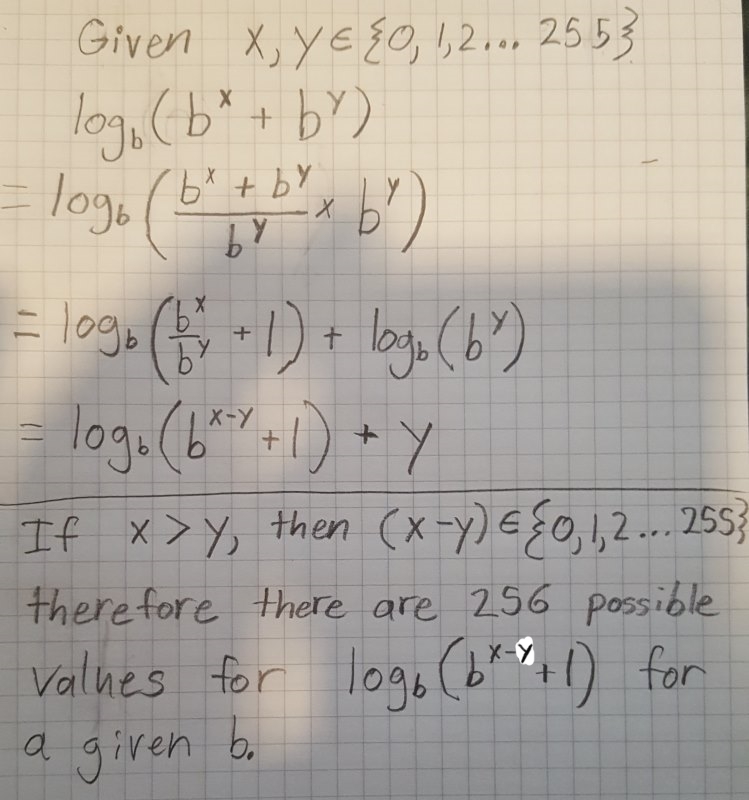 This meant that, in order to make my computation, all I needed to do was find the max of x and y, then subtract some value taken from a lookup table with abs(x-y) as its index. I wasn't certain that this was actually true, nor was I sure how abs(x-y) related to (log2(2^x + 2^y) - max(x,y)). WolframAlpha wasn't cooperating, so I had to break out my rusty algebra skills and figure out for myself whether this trick would work. What I ended up with was this proof: "The Proof That If You Want log_b(b^x + b^y), And X and Y Are Both Bytes, You Can Compute It Using Comparisons, Additions, and a Lookup"
Are you interested in adding this extremely situational code to your own project? Well good news! You can. Just copy this code, and you'll be computing 16*log3(pow(3,A/16) + pow(3,B/16)) in no time. Want something slightly different? Turn your eyes to the python code in the block comment, set the variables to what you want them to be, and then pre-process it with a standard setup of Cog. You can efficiently sum and then compactly store powers of whatever number you desire. Powers of 2, powers of Pi, powers of your lucky number... knock yourself out! EDIT: As a side note, lookup tables can be implemented in SIMD code using a PSHUFB instruction. I'm hoping that the ISPC compiler will take advantage of this sometime soon. "return A > B ? LOOKUP[A-B] + B : LOOKUP[B-A] + A;"
This code will generate ugly branch. It's too complex for compiler to optimize. Good catch... I wanted to show off how simple the run-time computation was and ended up making it slower. I know this isn't a complete optimization article, since I don't have the performance numbers for a fair comparison between techniques. Maybe I'll do it, idk.